Joe’s Tow | "When Life Lets You Down, We’ll Pick You Up!" Looking for a certified towing and recovery company? Our drivers are WreckMaster 6/7/a certified. We are located in Davie County, North Carolina and are on the approved list for the North Carolina Highway Patrol, Davie County Sheriff's Office, Mocksville Police Department, and Cooleemee Police Department towing rotations. Special discounts for Teachers, Police Officers, EMS, Fireman, Military Personnel and South Davie Super Saver Card holders. When Life lets you down, you can count on us, to pick you up! Need a local or long distance damage free tow? Our professional staff can assist you 24 hours a day. We provide off road recovery for any type of vehicle or equipment. From tricycles to bulldozers, we have the specialized equipment to meet your needs. Are you moving in or out of town? We can get you set up with a low cost U-Haul truck, trailer, appliance dolly, and/or supplies. Locally owned and operated in Davie County, NC. 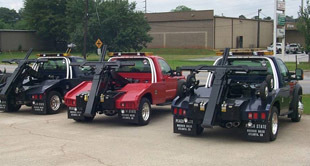 We are a 24 hour towing and recovery service that operates a fleet of four towing vehicles consisting of a rollback, small/medium duty wrecker, and two large/heavy duty wreckers. We also have flatbed trailers, dry van trailers, reefer trailers, a skid steer, dump trucks, road tractor, crash/ recovery trailer, service vehicles, and various other pieces of heavy equipment. We offer free lock out service to children locked in cars and to the elderly. Our everyday mission is to provide you with the best in damage free, local and long distance towing, with the quality that you would expect from a top notch business. We provide services for AAA, Fleetnet Motor Clubs, Geico, Good Sam, Road America, and Cross Country. Joe's Tow is a locally owned and operated towing and recovery company owned by Joseph and April Crotts. They have grown their business to what it is today by caring about people and the community in which they live. Joseph is a member of the Davie County Rescue Squad, and Cooleemee Fire Department. He is also a member of the NC Towing and Recovery Association and is certified by WreckMaster as a heavy duty towing and recovery operator. He also donates time and energy to the D.A.R.E program to keep kids off drugs.